Since 1991, Somaliland has made steady democratic gains and is attracting foreign investment, given its strategic location along the Gulf of Aden. Its democratic stability and its economic interest allow for some optimism regarding a potential international recognition of Somaliland’s sovereignty. While the international community has widely acknowledged its separation from Somalia, no State has yet formally recognised Somaliland as a State. While The African Union should take the lead in the recognition process, it is reluctant to do so as it fears such a step would encourage other secessionist movements on the Continent. Somaliland has been a self-governing region of Somalia for more than two decades, but its claim of independence is not recognized by Mogadishu or any foreign government. While this has limited Somaliland’s access to international markets, it has not prevented the breakaway state from making steady democratic gains and attracting foreign investment. Some analysts say Somaliland, which has a distinct history and remains more stable than the rest of Somalia, has a strong case for independence. Others fear that international recognition would encourage other secessionist movements in Africa. Somaliland is part of Somalia and the larger Horn of Africa region. It has hundreds of miles of coastline along the Gulf of Aden to the north, and it borders Ethiopia to the south and west and Djibouti to the northwest. Puntland, a semiautonomous state of Somalia that lies due east, disputes some of Somaliland’s territorial claims. What is its political status? Somaliland has sought international recognition as an independent state since 1991. No foreign government recognizes its sovereignty, but many effectively acknowledge the region as separate from Somalia. Some, such as France, the United Kingdom, and United States, as well as the European Union, sent a delegation to observe Somaliland’s 2017 presidential election. The state effectively broke ties with Somalia’s government in Mogadishu after declaring independence. It has held its own democratic elections since 2003, and in 2010 it saw a largely peaceful transfer of power to the opposition Peace, Unity, and Development Party. Somaliland’s history as a distinct region of Somalia dates back to the late 1800s. The territory was a British protectorate until 1960, when it unified with the rest of present-day Somalia, which had been under Italian rule. The merger faced challenges early on, with many in Somaliland rejecting the centralization of power in the country’s south. A rebel group, the Somali National Movement (SNM), emerged in Somaliland in the 1980s opposing the military junta of President Siad Barre, which seized power in 1969. In January 1991, SNM and other insurgent groups ousted Barre, whose forces had killed tens of thousands of Somalilanders [PDF] and destroyed much of the region’s infrastructure. SNM refused to recognize an interim government led by another militia group, and that May it declared Somaliland’s independence, with the city of Hargeisa as capital. It took delegates a decade to thrash out a new constitution for Somaliland, which voters overwhelmingly approved in 2001. The referendum saw a transition from a power-sharing agreement among leading clans to a multiparty democracy. Although some international observers applauded the peaceful vote [PDF], no government recognized the process. What is Somaliland’s case for independence? The Somaliland government asserts that it meets most of the requirements of a sovereign democratic state: it holds free and fair elections, has its own currency and security forces, and issues its own passports. It also says that its independence claim is consistent with a longstanding norm [PDF] of the African Union and its predecessor that colonial-era borders should be maintained. Some analysts also note that Somalilanders are predominantly from the Isaaq clan, and thus ethnically distinctive from other Somalis. What is its financial situation? A weak economy and limited opportunities for foreign trade and investment have stifled the government’s capacity to provide services to its approximately four million residents. Somaliland has a gross domestic product (GDP) of about $2 billion, most of which it receives in remittances from Somalilanders working abroad. Its main export is livestock, which it ships to neighbouring Djibouti and Ethiopia, as well as to Gulf states, such as Saudi Arabia and Oman. Its GDP per capita, in the hundreds of dollars, is one of the lowest in the world. Meanwhile, the government will be ineligible for loans from the World Bank and the International Monetary Fund as long as Somaliland is not an internationally recognized state or reconciled with Somalia. President Muse Bihi Abdi, in an op-ed after his November 2017 election victory, said that Somaliland’s exclusion from international markets “compounds the socioeconomic pressures that Somaliland faces,” and analysts say that an anemic economy puts decades of political progress at risk. Where do negotiations between Somalia and Somaliland stand? International mediators hope dialogue will soon begin. The United Nations’ top envoy to Somalia, Michael Keating, says the time is right for fresh talks given leadership changes on both sides. “Both Farmajo and Bihi are up for it,” Keating told CFR. Negotiations could focus on common concerns, such as drought and environmental degradation, security and maritime issues, and airspace management, Keating says. But complicating this diplomacy is the tenuous security situation in the rest of the country. For more than a decade, regional military forces supported by the African Union and United Nations have been battling the Islamist militant group al-Shabab. Mogadishu suffered its worst terrorist attack to date in October 2017, when suspected al-Shabab fighters detonated truck bombs that killed more than five hundred people. Meanwhile, a severe drought has put millions at risk of famine. 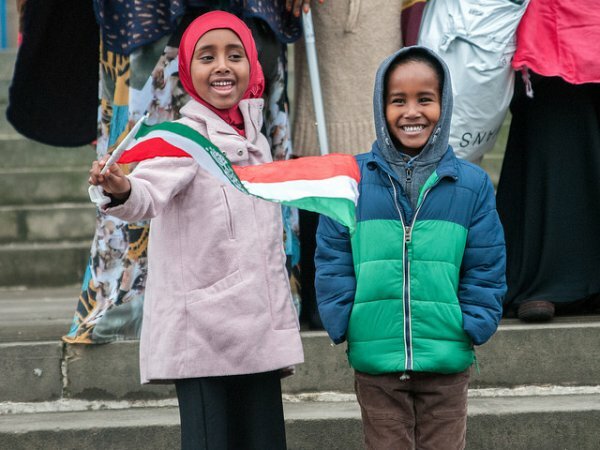 Is there international support for Somaliland’s independence? Many countries have encouraged the breakaway state’s elections and economic development, but none have recognized Somaliland. Some experts say the African Union would have to be the first to do so. “The United States and the UN and all of their allies have worked hard to try to build up the AU and position it as a moral authority,” says Bruton. The bloc, however, fears that formal recognition would embolden other secessionist movements on the continent, such as Nigeria’s Biafra or Morocco’s Western Sahara, to demand the same. Since the creation of a continental bloc in 1963, there have only been two widely recognized border changes in Africa: Eritrea’s split from Ethiopia in 1993 and South Sudan’s independence in 2011. What is Somaliland’s strategic importance? Somaliland is positioned along the Gulf of Aden near the entrance to the Bab al-Mandeb, a major sea-lane through which almost one-third of the world’s shipping passes. Its location has helped the government attract new trade and development deals. For instance, in late 2016, a Dubai firm announced that it would invest nearly $450 million to manage and upgrade the port of Berbera [PDF] and develop a corridor running from there to the Ethiopian border. Ethiopia is reportedly negotiating a share in the deal. The Horn of Africa has also attracted security-related investments in recent years. Djibouti has become a hub for foreign military bases; China, France, Italy, Japan, and the United States all have facilities in the country. Somaliland has followed suit, signing an agreement with the United Arab Emirates in early 2017 to build a military base at Berbera.